British police are investigating reports of electoral fraud alleged to have taken place during UKIP leader Nigel Farage’s unsuccessful South Thanet campaign. A spokeswoman for Kent police said “inquiries were ongoing” and the constabulary could not say any more at this stage. 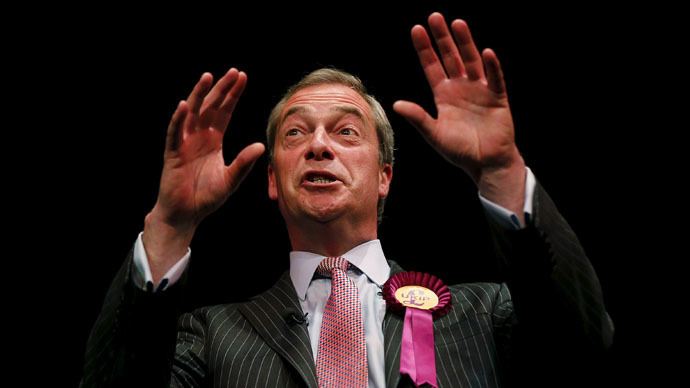 Farage failed to win the hotly contested seat and subsequently resigned as leader of UKIP in keeping with a promise made during his election campaign. However, his resignation was refused by the group’s National Executive Committee (NEC) on Monday and Farage continues to head the organization. Conservative MP Craig Mackinlay won the Kent seat with 18,838 votes, nearly six percent more than Farage’s 16,026 votes. Liberal Democrat contender Russell James Timpson saw a 13.2 percent drop in his party’s share of the vote compared to the 2010 election. Timpson lost his deposit having won just 932 votes or 1.9 percent of the total ballots cast. The South Thanet election saw a number of unusual candidates contest the seat against Farage. British comedian Al Murray campaigned for the fictional Free United Kingdom Party (FUKP), while the Al-Zebabist Nation of Ooog saw Prophet Zebediah Abu-Obediah pledge to physically separate Thanet from the mainland if he won the election.